Coming Soon: The new John Hoey Orchestra CD - A compilation of the last 3 years of "Live Recordings". Included in this special CD are numbers like: "The Way You Look Tonight", "Laura", "Fly Me To The Moon", etc. Here is a FREE .mp3 (large file) download of one tune from the new CD: I've Got you Under My Skin. 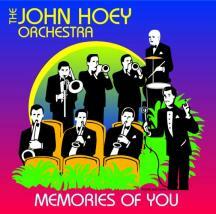 The John Hoey Orchestra CD, "Memories of You," is now available in limited quantities. 13 songs in all, including: "Saturday Night is the Loneliest Night of the Week", "My Kind of Town", "Shiny Stockings", "So Rare", and many more. CDs are available by mail at $10 each plus $2 shipping and handling. T-shirts with the CD cover graphic on them are also available; $8 each plus $2 shipping and handling. 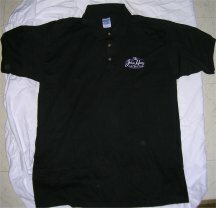 2007 T-shirts and Golf shirts are available. 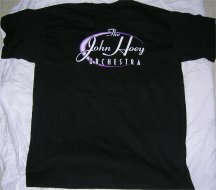 Black shirts with the white, purple, and silver John Hoey logo. Prices: $15 for the t-shirt, and $25 for the golf shirt, plus $2 S&H each. Please include your mailing address and contact phone number. Allow 10 days for delivery. This site best viewed with software that works, along with your eyes.